Untangling the Web of State Capture - How Far Does it Go? South Africa has been riveted by the damning evidence given by senior public officials who served in the Zuma administration to the Zondo Commission of Inquiry into state capture. The allegations have until now mostly involved former president Jacob Zuma's associates, the Gupta family. 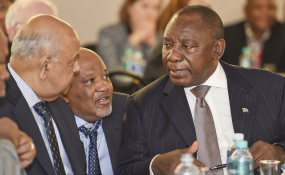 When former deputy finance minister Mcebisi Jonas made the startling claim that the Guptas had offered him the position of finance minister in exchange for R600 million, the term 'state capture' found its way into South African political parlance. Former public protector Thuli Madonsela's 2016 State of Capture report outlined the Gupta family's influence on cabinet and tender processes. The report detailed interactions with then Eskom CEO Brian Molefe and others, like former African National Congress parliamentarian Vytjie Mentor, who also blew the whistle. Investigative journalists have delved extensively into the relationship between Zuma, the Guptas and their personal enrichment through South Africa's state-owned enterprises. So there's plenty of information on state capture in the public domain. At the Zondo commission, both Jonas and Mentor testified about being summoned to the Gupta home where they were offered cabinet positions in exchange for cash and favours. Former government communication head Themba Maseko also gave powerful testimony of being asked to divert funds to the Guptas' ailing newspaper The New Age. Of course these allegations will have to be tested and the Zondo commission is already being criticised for its drawn-out processes. But that is the nature of commissions of inquiry. They are designed to seek truth after all, and witnesses as well as those who are impugned, have the right to be protected by the law. It will be a lengthy and costly process to find out just how deep the rot is that Zuma left behind. Testimonies are being made under oath and in a public forum for the first time. This in itself is a triumph for our collective 'right to know'. President Cyril Ramaphosa has tried to move swiftly to deal with institutions that should uphold the rule of law but have apparently been infected by corruption. For example he's suspended South African Revenue Service commissioner Tom Moyane and appointed new heads for the Hawks investigation unit and the State Security Agency. The Zondo commission should subpoena those implicated in the deterioration of the criminal justice system to establish how deep the corruption runs. While there already are inquiries into the revenue service and State Security Agency, more attention must go to state capture in the Hawks, the South African Police Service and the National Prosecuting Authority. The Hawks have been linked to corruption in both Maseko and Jonas's testimonies. Jonas outlined how the Hawks tried to quash investigations into the Jonas-Gupta matter. The police must explain why it never acted on the vast amount of evidence of corruption during Zuma's tenure. Specific attention should also be directed at the former national director of public prosecutions Shaun Abrahams. Why did Abrahams seemingly bend over backwards to avoid prosecuting Zuma and his associates, creating an environment in which the state could be captured? Daniel Kaufmann and Joel Hellman, writing for the International Monetary Fund, describe state capture as 'the efforts of firms to shape the laws, policies and regulations of the state to their own advantage by providing illicit private gains to public officials'. 'Because such firms use their influence to block any policy reforms that might eliminate these advantages, state capture has become not merely a symptom but also a fundamental cause of poor governance,' they say. It all sounds familiar, but what ordinary South Africans want to know is: When will those responsible for state capture appear in court? The Constitutional Court has allowed Ramaphosa 90 days to appoint a new prosecution head. Choosing an individual of the highest integrity and independence may well be the most important decision of the Ramaphosa presidency. Public pressure to prosecute those involved in corruption is mounting, but this will take time. The Zondo commission must be allowed to fulfil its mandate and make recommendations. The new head of prosecutions will need time to assess the evidence and decide which cases to pursue. The prosecution service is a broken and divided organisation that must be fixed so it can fulfil its constitutional mandate. The new head will have to rebuild from within and restore public confidence by prioritising prosecutions of those implicated in state capture. The Hawks will also need an organisational 'reboot'. The public must temper expectations of prosecutions in the short term. As with much of Ramaphosa's clean-up, the focus should be on careful evidence gathering and proper processes. There are no quick fixes for state capture, and the state that Zuma built can only be dismantled over time.